All the students should wear the uniform in the prescribed pattern and should take special care about the personal hygiene and to keep their uniform neat and tidy at all times. Accessories No Gold Ornaments, Expensive Wrist Watches, Fancy Bracelets etc. 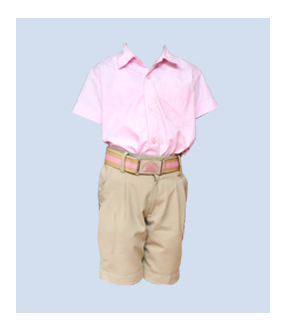 Shirt Light pink pin striped short sleeved shirt. 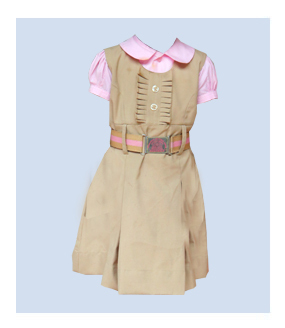 Skirt Beige pinafore in the prescribed pattern. Black Bloomers are compulsory for Girls on all Days. *Hair style Ordinary Hair Cut. No Fancy Cut. Girls with Short Hair should wear Uniform Hair Bow or tie it with black Hair Band. No Fancy Clips or Bands are allowed.